After a cloudy, gray day, the sun set tonight with very little color, only the faintest pale peach among the pale clouds, no fireworks in the sky to mark this last day of the year, just a quiet sinking, and swift fading of light into dark. The most memorable part of the day for me, in the end, was watching a Northern Harrier fly low over fields beside a road on my way to the grocery store. It was clear enough to identify, but never close enough to see really well, remaining just a little too far in the distance. Though we used to see them often in the winter, a Northern Harrier is a much less common sight now, so I pulled to the side of the road to watch. There was almost no traffic on this road at the time, though other, nearby roads were busy. The Harrier appeared to be gray, and it flew low over the fields, flapping its long wings often, then sailing low, a large, slender, graceful gray bird against a murky gray sky. It never came very close, and steadily moved further away until it moved out of sight. Even though it wasn’t a close or dramatic sighting, seeing the Northern Harrier seemed a beautiful way to end the year. I could see it as a ghostly, shadowy bird, because in truth, Harriers may be fading into the past, along with so many other birds of open places. Though populations of Northern Harriers are still widespread in North America, numbers have been declining for several decades, mainly because of habitat loss. Or I might see it as a hopeful sign, that even with all the changes here, the steady loss of wetlands, fields and pastures to more development, more roads, more traffic – still there is a Northern Harrier flying over a field of withered stubble and grass and weeds, and it was wild and beautiful to watch. While walking past a wooded yard of mostly hardwoods, along the lowest part of the road near a creek, I heard the rolling, churry calls of a Red-headed Woodpecker. I first discovered it here much earlier in the month, December 4. Even before that, I’d been hearing its calls for a couple of weeks or more, but had not been able to see it, and so I wasn’t sure. But this time I was finally able to get a good look. It was a juvenile Red-headed Woodpecker – with brown head, a white breast with blurry streaks, and black wings with broad white wing patches marked with some black. It was very vocal and active, calling often as it flew from tree to tree and back again in the same area, and returning again and again to one particular slender, broken-off, standing dead oak that was riddled with woodpecker holes and peeling bark. Since that day early in the month, though I haven’t been out often, almost every time I’ve come by this spot, the juvenile Red-headed Woodpecker has been here, calling and flying restlessly from tree to tree. Once I watched as a Northern Flicker flew from across the road into the area of trees around the standing dead oak – and a very agitated Red-headed Woodpecker immediately chased it away. Today, though I could hear its rolling chortle and could tell it was moving around from tree to tree, I could not spot it, mostly because of the gray light and also because it seemed to be close to the house and I don’t like to point binoculars or stare directly at neighbors’ homes for too long. So after a few minutes of just listening and watching for its movement, I walked on, deciding it was nice enough to know that it’s here. Most of the month of December this year has been too busy for me to be outside, or even to stop to notice the birds around our house – and that’s way too busy, I know. But it was an unusual time. A late-afternoon walk today, the last day of the year, was cloudy and gray like so many other days lately, but outside it didn’t seem gloomy. The light was a clear gray, and the clouds were high, layered, curled, and varied, the kind of winter sky in which there seems no end to the variations in shape and shade of the clouds, even though they’re all gray – milky, gray-white, pewter, silver, slate, smoke, pearl, dusky, taupe, blue-gray, ash, and streaks of charcoal. It was chilly and damp, in the low 40s, and a slight breeze felt sharp and good. As I stepped out the front door, a Carolina Chickadee chattered, and an Eastern Towhee called a rich chur-wheee. The hard, sibilant tseeeeets of White-throated Sparrows came from the dark leaves of wax myrtles and hollies. A young Yellow-bellied Sapsucker, its markings muted and mottled brown and black like tree-bark, showing only the faintest hint of red in the crown, worked quietly on the trunk and large limbs of a pecan tree. Dark-eyed Juncos twittered in high, soft, nervous tones in the trees. In thickets around the first corner I came to, a Ruby-crowned Kinglet chattered its dry jidit-jidit. Down the street and around the corner, birds seemed mostly quiet at first – only the peeps of Northern Cardinals, and the pink of a Downy Woodpecker, and isolated other calls from somewhere in the patchy trees – the rattle of a Red-bellied Woodpecker, the fussing of a Tufted Titmouse. Somewhere an Eastern Phoebe sang, one Carolina Wren trilled and another sang. Several Eastern Bluebirds, Yellow-rumped Warblers and Chipping Sparrows foraged in a grassy yard, scattering up into low branches as I walked by, with dry flicks and chips. A Pileated Woodpecker called its kuk-kuk-kuk traveling call from down in the woods. A little further up the road I heard a lot of chattering and found a feeding flock that included at least four, and I think six Brown-headed Nuthatches in the pines and hardwoods along the roadside. I’ve rarely seen so many Brown-headed Nuthatches together. 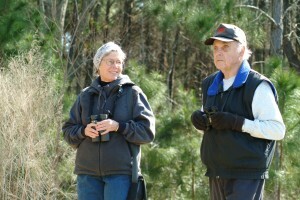 With them were Carolina Chickadees, a Yellow-bellied Sapsucker mewing several times, Yellow-rumped Warblers, Carolina Wren, Eastern Phoebe, Red-bellied Woodpecker, Downy Woodpecker, and Tufted Titmice. After watching them all for a while, I walked on up the hill, and around the crest of the hill, near a heavily wooded yard, I listened and watched for the Hermit Thrush I’ve sometimes found here, but there was no sign of it, no soft, liquid chup. Two small flocks of quiet Blackbirds flew over, at least a few Common Grackles among them. Further on, a much smaller and faster flock of other birds that at first looked like Cedar Waxwings flew across the sky ahead of me, well above the treetops. Then this flock was followed quickly by another, much larger flock of 100 or more birds that looked about the same, and so I don’t know for sure what they were. They didn’t fly like Starlings or Blackbirds or Robins – so I don’t know. It was that kind of day, gray and now-fading light, with mostly quiet flocks of dark birds fleeing toward the west, like words I couldn’t quite hear, or fragments of a dream, or moments almost grasped, but lost. Meanwhile, a White-throated Sparrow whistled its plaintive song from a yard of mixed shrubs and tall, brown grasses, especially sweet in the lovely, winter-gray quiet of late day. On a cloudy, breezy day in September eleven years ago, on a walk with my father in Pinckney Island National Wildlife Refuge, we watched a beautiful young Reddish Egret for several minutes. Unfortunately, I don’t have any photographs from that day, but the memory remains vivid, and my journal account from the time describes what we saw. It was late in the morning, muggy and warm, but not hot. Several dozen White Ibis were feeding in the marshes, a few rising up in flight from time to time, and around the Ibis Pond we passed three juvenile Little Blue Herons perched like white flowers blooming in the dense growth of trees and other vegetation around the pond. We had not gone far past the pond when I saw a pale, grayish egret standing in the middle of the wide, grassy roadway that formed the trail through the refuge. We stopped to get a better look when the bird was only about 20 yards away from us, maybe less – it was a first-year juvenile Reddish Egret. At first, my father kept walking toward it, and I was sure it would fly at any moment, but it did not. It seemed unperturbed. So we were both able to watch it at very close range for several minutes, a slender, long-legged, long-necked bird with a long, heavy, pointed bill – and even my father, who was not a serious birder and was usually impatient to walk on, was fascinated by the Reddish Egret’s uncommon beauty and entertaining behavior. One of the things I remember best is its ethereal coloring – a soft, pale gray and rosy-brown. The Sibley Guide to Birds describes the wings of a first-year juvenile as a “unique pale, chalky color,” and this is what it looked like, almost dove-like, but more lovely than words can express. A reddish hint along the folded wing was particularly noticeable. Finally, we came close enough so that the heron moved away, but still it didn’t fly. It just spread out its wings and walked into the marsh grass and shallow water beside the road, still not far away. There, it immediately started to search for food, opening its wings, hopping and stabbing at the water in its distinctive, unique feeding behavior, almost like dancing. We watched for several minutes more, then walked on. It was a memorable sighting – I could not have asked for a closer, more vivid look at a young Reddish Egret. On December 11 my father, Robert Gayvert, passed away, at the age of 94. He lived a full and fortunate life, as much as anyone could ask, but I will miss him. His love of gardening, especially flowers and flowering shrubs and trees – roses, gladiolas, lilies, azaleas, dogwoods, redbuds and many more – gave him the greatest pleasure, and is one of the greatest gifts he left to his children, grandchildren and great-grandchildren. Even though he never insisted on any of us sharing in his gardening work, we all picked it up in different ways. For myself, his influence had more than a little to do with my own early interest in organic vegetable gardening – which led me over time to a greater interest in all of the natural world – and to birds. 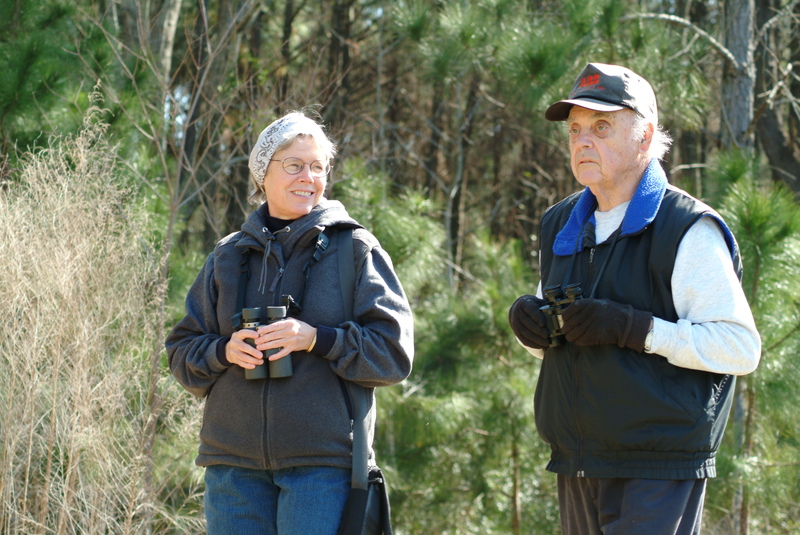 My father was not a serious birdwatcher, but he did love to take long walks, and on a few occasions he took along binoculars and joined me in birding – especially during the years when he and our mother lived in Bluffton, SC, near the South Carolina coast. During that time we visited Pinckney National Wildlife Refuge many times together, walking the trails and watching Common Moorhens and American Coots in the ponds, and also usually finding White Ibis, Great Blue Herons, lots of Eastern Bluebirds, Painted Bunting in the summer, Yellow-rumped Warblers in the winter, sometimes Wood Storks, and almost always at least a few other herons, egrets, ducks, shorebirds and songbirds. 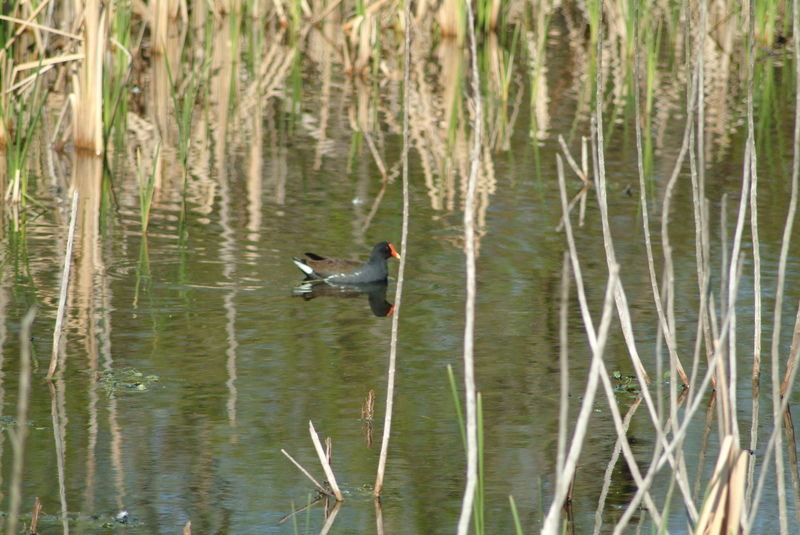 These pictures of us birding together at Pinckney, and some of the birds we saw – Common Moorhen and White Ibis – are among my favorite memories. The day began gloomy, with low gray clouds and a slow, cold rain that fell for a couple of hours. But as soon as the rain stopped, the clouds began to break apart and lift, turning pearl-gray and luminescent. Over the course of the morning, more and more blue sky appeared, leaving a loose, cottony quilt of small, high white clouds and sunshine. Late this morning, like the past three or four days, birds were delightfully active in several spots. One of the highlights of the day was the arrival of Dark-eyed Juncos – our first of the season. Several fed around our yard, and flew in and out of shrubs and the low branches of trees, flashing the white edges of their tails. I paused to watch two that flew into a small tree, seeing once again the smooth charcoal-gray hood that covers the head, the small pink bill and white belly. Then another sparrow-size bird flew up from beneath some wax myrtles and into the bare branches of a crape myrtle – a Song Sparrow, a heavily streaked brown and gray bird, switching its tail nervously from side to side, and raising the dark feathers on the top of its head into a slight crest. 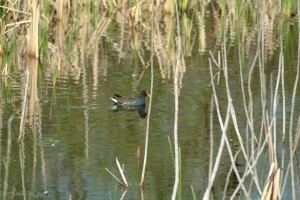 The brown streaks on its chest came together in a central dark spot. Though I’ve seen and heard Song Sparrows in other parts of the neighborhood this fall, this is the first one in our own yard – and I’m happy to see it and take it as another sign of more activity here, where things had been too quiet for too long. On the edge of one hilly section of woods, a brown, long-tailed, medium-size bird glided from one tree to another nearby and sat there, quiet, still and unobtrusive, on a branch. With leaf-brown back and head and brown-streaked chest, it blended in so well with the trees I would never have seen it if I hadn’t seen it fly. A juvenile Sharp-shinned Hawk, its head was small and round, with pale markings on the face, and overall, it looked neat and almost delicate. Its lower half was mostly hidden by branches, so I could not see the tail well, except that it was long and narrow. Although sometimes the presence of a small raptor like a Sharp-shinned Hawk can make smaller birds fall silent and still – in this case, the woods nearby continued to seem full of a good bit of activity and chatter, maybe a feeding flock moving through together – Carolina Chickadees, Tufted Titmice, Carolina Wren, Brown-headed Nuthatch, Yellow-rumped Warblers, Eastern Phoebe, Downy and Red-bellied Woodpeckers, a Ruby-crowned Kinglet or two. After I watched the small, sleek brown hawk sitting in the tree for a few moments, not moving except to turn its head one way and another, I walked on. 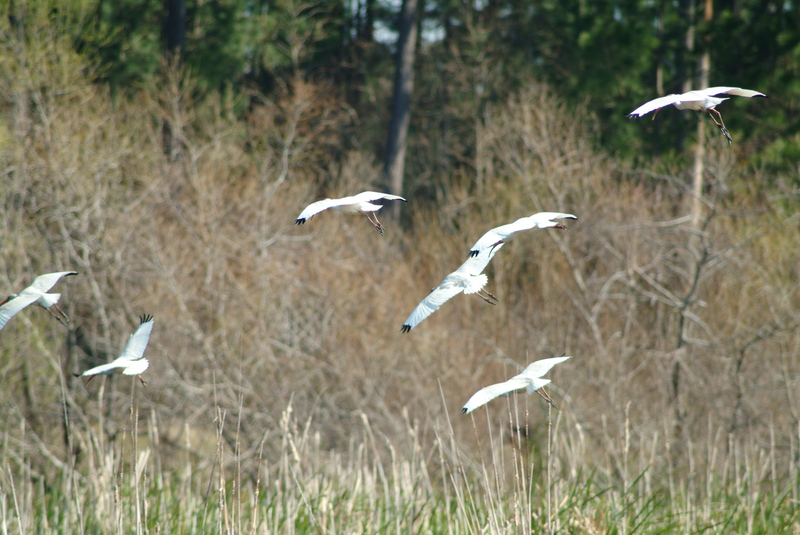 About the same time, it flew out of the trees and across the road ahead of me, and I could see its crisp, compact shape in the air, and its quick flap-flap-flap – glide flight pattern. The velvety, expressive hoots of a Barred Owl ushered in the month of December this morning, in the dark before dawn. HOOooo-aawww. HOOooo-aaaww. The owl called several times from somewhere in the trees behind our house, with pauses of several seconds between each call. The HOOooo was a clear, full hoot, followed by a descending, quavering aaawww. Invisible in the darkness, the huge owl, a female, I think, sounded wonderfully ghostly and wild. Then it fell quiet. I could only hear one owl this morning, though recently I’ve often heard two calling around five in the morning. It was a very fine way to mark the arrival of December. The day that followed was softly-clouded, gray and chilly. After last week’s heavy rains and wind, many trees now stand almost bare of leaves. The roadsides and yards were littered with leaves and small branches, all the colors look brown and gray and drab, and it’s beginning to look like winter. Late in the morning, a big Red-shouldered Hawk sat in the top of a bare-limbed oak, preening, its reddish breast muted by the gray light of the day. Many small birds were active below, in the lower branches of the trees and on the ground – Eastern Bluebirds, House Finches, Chipping Sparrows, Ruby-crowned Kinglets, Yellow-rumped Warblers, and White-throated Sparrows among them. A Yellow-bellied Sapsucker mewed, several Northern Flickers called kleer, Red-bellied and Downy Woodpeckers rattled. Blue Jays and American Crows were pretty much everywhere, as usual, and one Fish Crow called its nasal, two-syllable unh-unh as it flew over. The last few days of November have passed in a blur, the rush of the holiday season already upon us, it seems, along with several days of cold, heavy rain. Then the weather turned sunny, pleasant and cool, but still without much time to spend outside watching birds. After weeks of looking very quiet and empty at times, the morning of Thanksgiving Day, our front yard suddenly seemed to be full of birds. Carolina Chickadees, Tufted Titmice, a Northern Cardinal, one Brown-headed Nuthatch, and a Downy Woodpecker came and went from the feeder. A Ruby-crowned Kinglet chattered in one of the Savannah hollies. Mourning Doves flew up in a flurry of whistling wings from the ground. Carolina Wrens sang, burbled and fussed. Yellow-rumped Warblers flitted from branch to branch through the pecans and oaks. Five White-throated Sparrows and one handsome Brown Thrasher – the most fun to watch – foraged in the mulch around ferns, yews and Lenten roses, kicking up the brown leaves. A good many small birds were active late this morning, on a clear and sparkling day, with blue sky, a few high white clouds, and a bright warm sun. The sunlight turned the lingering brown of the oaks to glowing copper and brought out the beauty in the last few orange and dull yellow colors of fall, so different from the way the landscape now looks on a cloudy day – and we’ve had so many cloudy days this year. As I walked down the road, an Eastern Bluebird flew from a tree to the ground, breathtakingly blue. A dozen or more Chipping Sparrows scattered up from the grass into small trees. A Ruby-crowned Kinglet chattered, and Yellow-rumped Warblers called chip as they flew from tree to tree. Brown-headed Nuthatches squeaked up high in the pines, and one White-breasted Nuthatch honked its small, nasal call. A Red-bellied Woodpecker chucked, a Downy Woodpecker whinnied. A Northern Flicker called kleer! In one of the more wooded parts of the neighborhood, a solitary bird about the size and shape of a Robin, but more slender, with a certain willowy grace, stood in the middle of the road ahead of me, head up, looking around. It was a Hermit Thrush – the first one I’ve found here this season. It was pecking now and then at a litter of leaves, pine needles and other debris in the road, washed down by recent rains. It was especially nice to find a Hermit Thrush here, in exactly the same area where I often watched one last winter, near one particular yard with lots of hardwood trees and a scattering of young beech trees. Because it stood in a shady spot, I couldn’t see its markings very well or the rufous in the tail, but the spots on its chest showed up, and its shape and posture and behavior identified it well – the way it held its head, slightly tilted back, with the thin, pointed bill held slightly up. It twitched its tail from side to side – not raising and lowering it as it often does. When I took a couple of steps closer, it flew, along with several other, smaller birds feeding along the roadside. On a dark-gray, drizzly day, flocks of American Robins and Cedar Waxwings filled the thickets and trees in and around the old field with a bustle of activity. The Robins squeakily called, perched in several trees, and restlessly flew back and forth across the road. I could hear the thin high tseees of the Waxwings, but couldn’t see them in the murky, misty light until they flew – one flock, then another and another, suddenly flying up and away, at least four dozen Cedar Waxwings, maybe more. Then a raspy call came from a very tangled and weedy area across the road from the field – a Gray Catbird, perched on a low limb of a tree choked in weeds and vines. Dark-gray all over, the Catbird blended in with the shadows, but switched its tail back and forth assertively, and repeated its cat-like mew several times, a prickly, abrasive mew that reflected the scrubby, tangled surroundings a Catbird often loves.